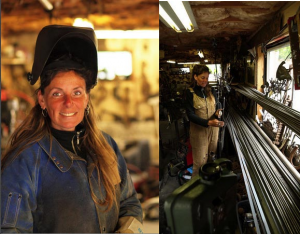 Canadian artist and single parent Karen Lancey is proud to say she’s supported herself and her two daughters as an artist and welder for fourteen years. Welding was almost a given. “I was an artist….so it was a natural progression to want to stick things together,” she says. She enjoys creating things out of nothing, being her own boss, and having people buy the things that she loves making. What advice would she give her 15 year old self? What advice would she give young women interested in welding as a career? Do it! Have a tough skin until you have either age or experience and just jump in and do it. Find out more about Karen Lancey at her website, http://www.metalmermaid.com. This entry was posted in New Rosies on April 8, 2015 by Carmen. Awesome work! I have been working in landscaping (horticulture) for ten years and needed a change. I am an artist (painting mostly) and have always been fascinated with scrap metal. So, I enrolled at a local technical college that has a good welding program. It’s exciting. I plan to do sculpture and travel. Your story is an inspiration. You have beautiful work. What advise can u give me ,starting my first welding class, the only female in.the class anything I should know? I am in the same situation as domici. I have not started it yet but am very excited for the class. I’m taking oxy acetylene. Do you have any experience in this field? Do you have any tips? 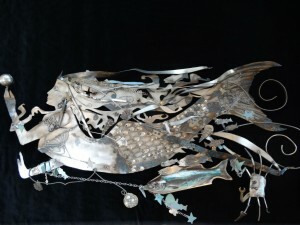 It’s incredible that Karen and her daughters are creating art by welding metal. I’m impressed that she’s been creating welded art for fourteen years. That’s a long time to develop and perfect her craft. That seems apparent after looking at this picture of the mermaid that she made. It looks so intricate, I can see why it would take a lot of skill to make something with that many components. I would be interested to see some of her other works that she’s made with metal. My husband purchased cheap plasma cutter by using comparing websites like http://plasmacutterpro.com/, etc. and I’ve tried to cut home accessories metal sheets but had no success. And this work is amazing! I’m inspired! It is amazing how you managed to stick by your ideals for so long and succeed in life. It is nice to see more women interested in trades like welding and metal construction. It is especially great that is done because of art. Might you be familiar with Rosh Metal ? Their blog is a great source of information about metal construction, including various welding techniques. Thank for your story, you inspire me !. keep it up karen, it’s hard for a woman to be into welding job, but once you make it, you rule it! I think, only 5% of welders are women. The advice I hear most often from welders, both men and women is that training and experience will take you far. So, Karen’s advice to her 15 year old self is a great one.